The backyard and a puppy are two things most homeowners can’t live without. You spend a lot of money to make your yard a place you love. You also spend a lot of money on your doggie. In fact, according to Business Insider, Americans spend an average of $139.80 per month on their dogs. You can read more about how much Americans spend on their pets each month here. There is a common problem with a lot of Americans when the yard they love and the puppies they love collide with each other. Dogs have a way of ruining your beloved landscaping and yard. The two most common dog problems are digging and their waste. When your dog urinates in your yard, it is saturated with high levels of concentrated nitrogen. This nitrogen concentration causes the spots or patches of brown on the grass. Solid waste can also eventually cause damage as well. It seems like common sense, but walking your dog will help with digging because they get exercise and exert energy. Your dog will also be able to relieve itself in areas other than your beloved yard. Create a designated part of your yard as a potty area for your pooch. You can use pea rock or mulch in this area. Pick up your dog’s waste in a timely manner. If you’re looking for this or other solutions to your yard and landscaping, call Southern Landscape Supply today. 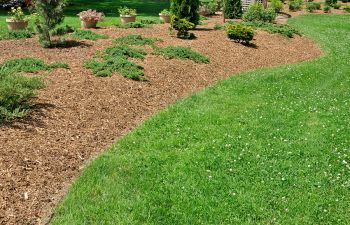 We offer many products such as topsoil, timbers, sand, gravel, boulders, sod, mulch and stone.